The ticket for the San Francisco Conservatory is a bargain. Especially on an overcast drizzly day, it was a great destination to do something fun. Even the garden that welcomes you on to the grounds is remarkable. 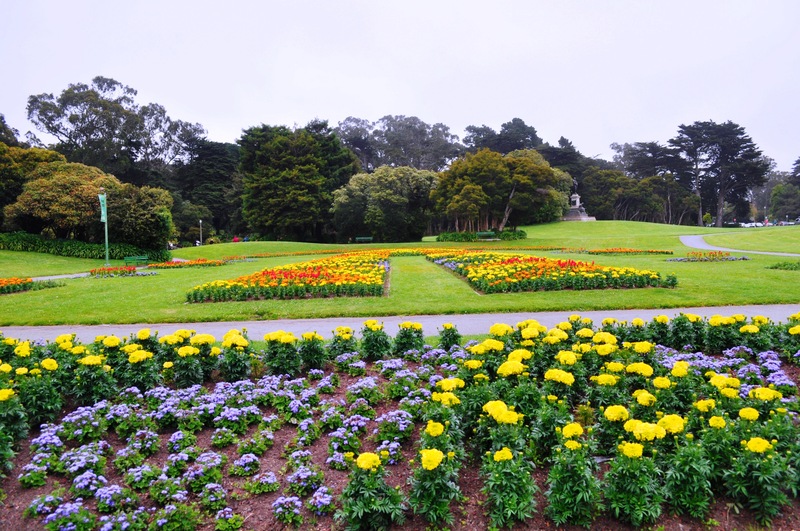 Both sides of the path were lined with thousands of carefully landscaped flowers. It was a vast display of oranges, reds, yellows and of course massive amounts of every shade of green. They weren’t exotic blooms, rather they were common. Yet, in bountiful numbers they were stunning. When God created flowers, He clearly slowed down His pace and took His time. These sometimes delicate often times hardy climax of flora expressions have an endless variety of details. Usually, I walk past them. Today, I took their picture. Then, I looked closely and marvelled at the variety. Up close and personal, these flowers are fantastic. The petals have the same shape multiplied many times over. There is no chaos here. Nothing is haphazard but stunningly well-designed. Then, another kind of plant is different. Yet, they too are consistently organized. From plant to plant, the variations but consistency point to a reasonable conclusion that a Master Designer was at work. Sunlight was in scarcely evident. A diffused light convinced us it was daylight. 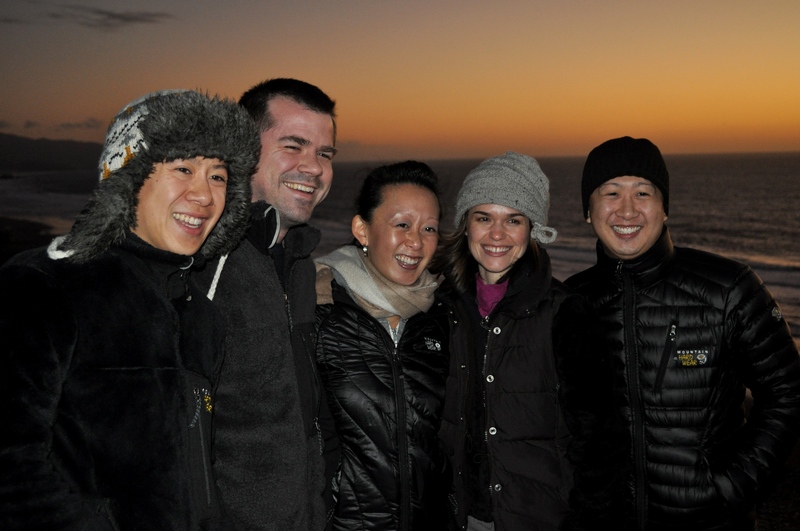 But, the cool air and brisk wind made us feel a need to resort to another kind of warmth. From the details of each flower and plant I backed off to head for shelter. But, the expanse of the garden engulfed me again. My camera lens isn’t equipped with a wide enough lens to capture it. Together Yvonne and I climbed the steps to the entrance of the conservatory. We could both feel the chill in the air. A gust of wind accentuated the cool temperatures. Quickly we diverted our walk to the right. That was the ticket booth. There the attendant told us how much the tickets would cost. When we showed our San Francisco I.D. we got a smile and a discount. She gladly gave us our tickets and a brochure to guide our visit. We walked into the foyer of the Conservatory and were greeted by the ticket taker. Why they could consolidate the greeter and the ticket seller into one eludes me but that’s for another blog. Now, it was time to see the tropics in the middle of a cold San Francisco day. During my vacation I sorted through the collection of DVD’s and called the two grandpups to join me in the living room. 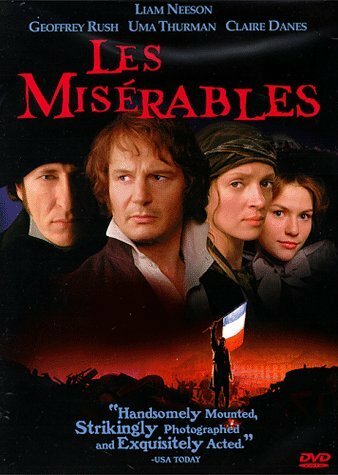 The three of us were going to watch Les Miserables starring Liam Neeson as Jean Valjean, Uma Thurman as Fantine and Geoffrey Rush as the obsessed policeman driven by a legalistic attitude that defies grace or goodness. I have given considerable thought to this story. While I was watching the movie, I knew that I would write about it. But, how do you blog in a few hundred words what Victor Hugo did in 1200 pages? These characters draw you into their individual lives. Their lives are engrossed in struggle, conflicting values and plagued with circumstances beyond their control. It is a mixture of inhumane travesty and generous mercy. I have chosen one theme to consider for this piece. It is the struggle between Valjean and Fantine. He is a convict in hiding but his promise to God to change is his new motivation in life. Valjean helps Fantine, a local prostitute forced into desperate measures out of love for her daughter. No one else would help her but just the opposite took advantage of her. She lived to provide for her daughter entrusted to the care of selfish, cruel and greedy tavern owners. Javert is the local police inspector. He sees an episode that makes him suspicious of the Mayor. He is self-absorbed and obsessed suspicious that the Mayor is in fact Valjean. The crime was stealing bread. He was hungry and his family was hungry. Not only did he pay for the crime in prison but also served for many years more for attempted escapes. No thoughtful spectator could keep from shaking their head at the injustice of such a penalty long paid but still dogging this man from true freedom. No matter how much grace Valjean displayed, Javert would not let up his self-justification of applying the law. It is a common scenario of passion that far exceeded a not-so-mortal-an-offense. The display was a hatred under that guise of justice. In the end Javert is unable to come to grips with his desire to administer the law which was in conflict with Valjean’s constant display of goodness. He takes his own life to end what he considered a pure devotion that had no place in life where grace instead should abound. Redemption came when grace overcame law and death was the ultimate price. 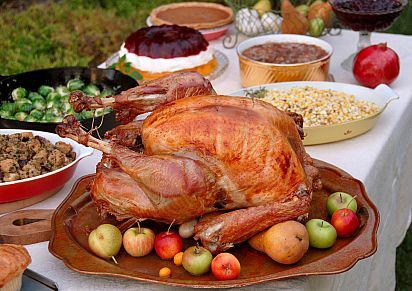 Our Thanksgiving dinner was scrumptous. Everyone had plenty to eat. The leftovers told us that we had made plenty of food. It wasn’t long before a couple of the men in our family were sound asleep. In the background was the roar of a football game on television. But, even the battle on the gridiron could not keep full tummies from wooing the male species from getting some reading done on the back of their eyelids. 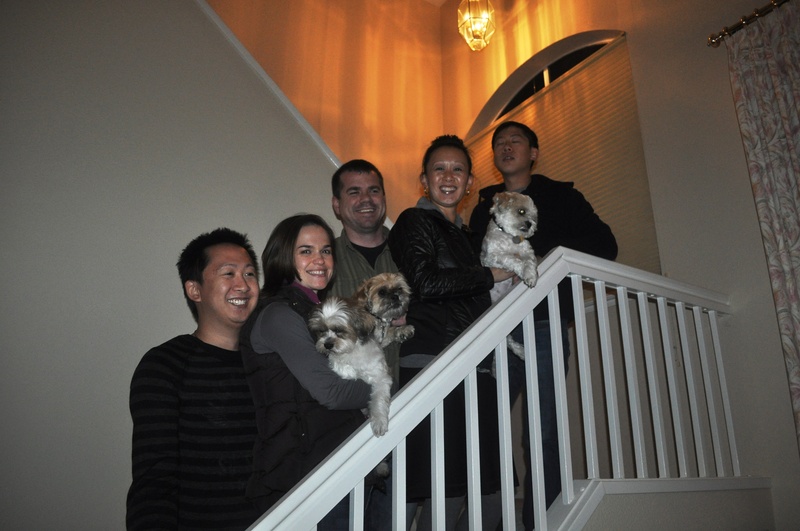 One of our family women enthusiastically suggested that we do our family picture. That’s when we thought that a sunset at Fort Fulton would be a great idea. But, that meant that everyone had to wake up and all of our cameras had to be retrieved. By the time we loaded up the vehicles and got to the spot the sun had already set. Rats! The best laid plans seem to go awry; but at least the family is having fun teasing and goofing off. Besides there was still enough light for some fun pictures. Of course the pictures don’t tell the story in full. It was cold out there! The coastal winds were blowing in and drowning all of us with brisk temperatures. Down jackets and warm hats made for the perfect attire. With a few outdoor shots we all jogged back to the vehicles just to get warm. We laughed as we gasped for air and warmed up with the heater turned up to high. Back at home we weren’t done with our entertainment in front of the camera lens. Now, we would use the house stairs. Our family of five kids took up their positions and peered over the rail. Mother and Father proudly let the cameras snap freely. We laughed, cajoled, teased, pushed, shoved and poked. All of those family gathering antics were a part of our portrait time. What isn’t seen is more entertaining than what is seen. The day of Thanksgiving is just about over. It has been a target day on all of our calendars. We talk over the blessings of the year, reflect over our careers and update each other on the great stuff of life. Then, it’s time for more football. Yeah, the guys take up their positions on the sofa, recliner, love seat and the images of warriors on the grass field struggle to dominate the pig skin. We cheer and shout along with our commentary on each key play. It’s family and it will always be fun with food and fun. Breakfast is my favorite meal of the day. Of course it matches since I love the morning. If I can be up and greet the sunrise, I’m a happy guy. Washed up and geared up to start my day is a great way to begin the new day and discover God’s new blessings. Enjoying a hot meal to walk through my appointments makes for a great strategy. Downing a sumptuous meal of corned beef hash, poached egg and a tasty beverage is unbeatable. Now, that Thanksgiving was over the kids wanted to have their traditional breakfast out at a local coffee joint before everyone hit the road. Today’s choice was Starbuck’s. This is new to Yvonne and me since we are not java kind of people. The seven of us walked into the beanery surrounded by friendly servant oriented staff and a decor that matched the aroma of coffee central. I tried to listen to my offspring as they placed their orders. This was new language for me. Latte, grande, tall and other odd words were spoken with certainty and familiarity. I had no clue what kind of connection existed between my own children and this business of barristers and foam making machines. My turn. I ordered what Yvonne asked me to order. Of course I added the size, “small.” The guy at the counter repeated my order but called out “tall”. I tried to correct him. Oops. All of us crowded around a long table. The food on the table was a remarkably contrast of tastes. It was divided clearly around the feature of age. The young had their fancy coffee blends with additions. Each were in insulated cups. They nibbled on muffins and scones. Yvonne and I, chic parents that we are, enjoyed a spiced hot chocolate and strawberry smoothie. We had fruit with our breakfast. This is a place where the food was not the focus of our gathering. Even the beverages were not central, while they tried. Instead, something much more lasting was the magnetic of the moment. Family reigned at breakfast this morning. We enjoyed being to gether and the stuff on the table was just a small part of hanging out together. Conversation dominated our time together. We talked about our faith. Our conversation addressed business, leadership, spirituality, Bible, faith and ministry. It was healthy, thought-provoking and meaningful. What a blessing it is to be a family that enjoys and benefits from being together. The door bell rang. I bounded to the front door with enthusiasm. My hand wrapped around the door knob, tightened with a firm grip and twisted with a pull to reveal our guests who had come for our first Thanksgiving dinner of the year. Smiles, squeals and salutations erupted when our eyes met. 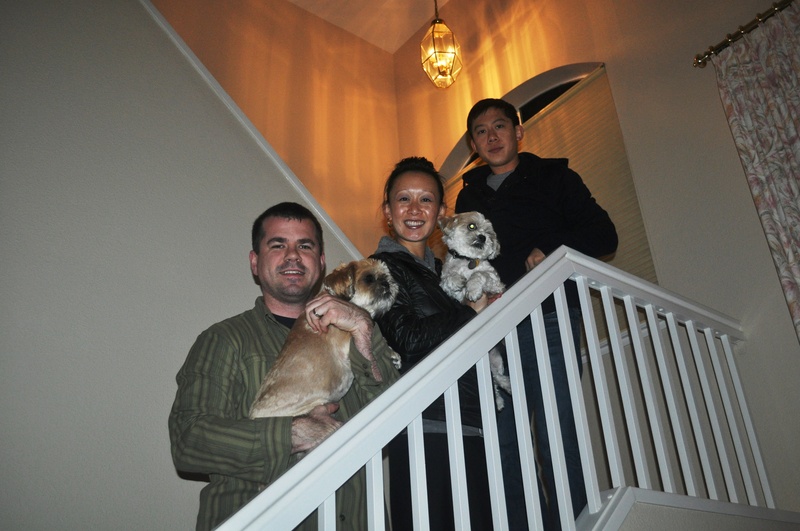 People crowded into our home and the sound of people celebrating did not end. Coats, scarves and shoes were left at the entry while hungry appetites and expectations for fun populated our little home. All were family. These relatives were eager to lend a hand in the kitchen. Food was filling up every empty space on our counter. A vegetable dish of young tender gailon caught my eye. Next to it was a huge pot of black mushrooms. Mash potatoes, sweet yams and meatballs were added to the growing feast. Soup was simmering on the back burner. The dessert of apple crunch cobbler was being basted. Beverages of every kind both cold and hot were ready at the corner of the counter. Bread was adding its aroma to the delectable of the table fare. The cranberry sauce was lost in the shuffle. Literally, it was sliced, place on a serving dish and forgotten in the refrigerator for the umpteenth year. But, the star of the show was making its regular appearance. The centerpiece of the celebration was slowly roasting in the oven. Periodically, it had to be taken out and turned. That manly muscle job was mine. When our star cook, my wonderful wife, gave me the signal, I approached the oven with hot pads in each hand. Opening the oven the door was like a signal to all of the ravenous carnivores to begin salivating. Heads turned, eyes dilated and smiles erupted. I hauled that bird out of the oven and transported it safely to the stove. Yvonne deftly turned the turkey over, basted it appropriately and recovered it with foil. My role repeated itself in reverse order. Back into the oven ol’ Tom went. The door was shut for more roasting time. But, the aroma was now a part of the kitchen promise of a feast for the year. Roughly on time, our family crowded into the kitchen. We bowed our heads to our father in heaven, gave thanks for His blessings and bounty then in semi-orderly fashion we filled our plates and feasted. I thank God for yummy family! Jesus had left Galilee for the last time. He was resolute to travel to Jerusalem. While most in this northern region would go out of their way to avoid travelling through Samaria, our Lord chose just the opposite. When He entered a Samaritan village, the local population did not welcome Him. That is astonishing. He disciples were miffed and asked Him if they should call down fire from heaven to destroy them. Jesus rebuked them and changed his travel to follow the border to the Jordan River. On this detour ten lepers met Jesus and called out in a loud voice, “Jesus, Master, have pity on us!” While Jesus had performed healing on lepers before with a touch, a word of healing or forgiveness, He responded differently this time. Instead, He told the lepers to go and show themselves to a priest. This is odd for such an action would only be done to verify a healing not to obtain one. Yet, the ten without debate, reluctance or argument obeyed. This simple response of obedience is key. As a result of their following the Lord’s instructions they were healed on their way to the priest. One of the ten who was healed immediately turned around and went back to Jesus to thank Him and praise God for this miracle. We don’t know much about the other nine and what they did. The single healed leper who returned to thank Jesus was a Samaritan. He was from a people of mixed blood, ostracized by the Jews and rebellious against the laws of the Old Testament. This man had two historical community strikes against him: no hope as a leper and no hope as a half-breed. But, Jesus was pleased with his return. While the Lord was clearly disappointed that the others did not return to say thanks, this one did. He was the most unlikely to “get it” yet, he was the only one of the ten who did. Some may be tempted to assess this Samaritan as the only one who had real faith. But, that may be too harsh from what the Scripture allows. Certainly, this grateful man’s faith was highlighted, commendation from Jesus is clear. However, perhaps the best lesson that we can take away from this passage is what the expression of thankfulness means to a born again believer. 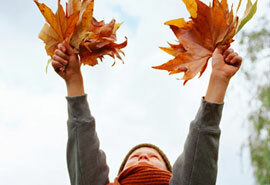 Christians who are the recipients of God’s grace can deepen their fellowship with God through thanksgiving. They capture the heart of God with their gifts of praise. Every time I walked through the garage that box sat quietly, unassuming and patient. It was too heavy to get moved around much. There were a lot of items that were stacked on top of it. This was a Christmas gift from my brother. He has one. After stopping by our place on numerous occasions, he realized that I could use one too. It’s been six months since he dropped it off. Only twice has he asked if I have used it yet. Once I stopped by his place and saw his. I liked what I saw. This is a motorcycle dolly. It is a heavy-duty ramp on casters. 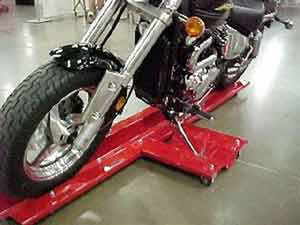 When a motorcycle is loaded on the ramp and locked into place, anyone can push it around a small garage. It makes so much sense. Right now I have to do a 20 point turn to do a 180 with my bike. This unit will allow me to spin the bike around. Furthermore, I can push the bike around into tight spaces. Our garage is smallish. We have storage challenges and the garage is the overflow. This dolly is a great idea and a makes very good sense for compact living. I have seen it in use and I was even more convinced that it is a useful unit. It even looks good. The challenge is implementation. No, it’s not a matter of putting something into use. I’m ready for that and have been for months. A bigger problem exists. First, our garage was buried under a lot of stuff that needed to be given away to the Salvation Army. It took months to get a truck here to take our extra furniture. Once that stuff was gone, I could finally get to the box that packaged the dolly. It was heavy. The dolly is made out of steel and supports a heavy motorcycle, so it has to be strong. I unpacked the carton. Now, I was ready to face what I have ignored for so long. The challenge of implementation was staring at me: assembly required. At least those who packaged this unit did not suggest that “some” assembly was required. No one who sells this kind of product ever puts on the carton “MAJOR” assembly required. The package of bolts, washers and nuts was loaded a massive number of parts that needed assembly. It’s almost done! Modern air travel has changed over the last thirty years of my professional career. The sound system for the passenger’s listening pleasure have improved immensely. I like so many, however, use our own I-pods with superior stereophonic sounds. Rising fuel costs and security measures have been a major distraction for air carriers. While they try and make flying more enjoyable these two external factors make this means of transportation more inconvenient. They are real problems, as real as a very bad employee who is righteous in her own eyes. The security line was jammed through all of the switchbacks. Hundreds of people were moving slowly. Inside I groaned. But, one of the agents told us that we could go to the other end of the airport, pass through security there, walk around the terminal and get to our gates. It was a little bit of a walk but it might be better than standing in line. That’s all some of us needed and we were off to the other end of the airport. I finally reached the security checkpoint. The information that the guard gave us was correct. There were only six people in front of me. We breezed through the security. Sure, I had to undress and redress after the machines scanned my glorious body for anything that was sharp, explosive or dangerous. But, now I was on the inside of the terminal. The longest line was now behind me. Swiftly, fellow flyers and I walked through the passage way to the other terminal. The walk was long but we passed the security area that we originally meet the massive numbers of travellers. It was still jammed. Now, I was at my gate. There were no seats open for waiting passengers. I stood, read and eventually found an empty seat. There I collapsed only to wait for an hour and a half for my delayed plane to welcome us aboard. I’m so glad that I got through security so quickly. Now, I could wait in an uncomfortable chair and sleep restlessly until my number was called to board our turbo prop plane. I fly enough that I am privileged to board early. Airport travel is one wait after the other. The trick is to hurry up with privileged access to wait for everyone else who is going to the same place. Is “airport” Latin for “waiting”? Johnny English humiliated the MI7 agency with an apparent botched mission. He felt that it was his fault. In his remorse English retreated to Tibet to do penance with monks while learning martial arts. HQ in London decided that English was the best agent for a new mission. 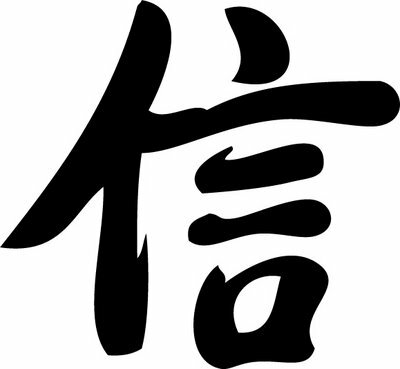 The Chinese premier was the target of international assassins. Once MI7’s number one agent, Johnny was recalled to London to take on this critical mission after a five-year hiatus. Don’t worry. If you want to see a serious drama in the genre of action espionage then this isn’t a movie for you. However, if you are in the mood for a chuckle, goofiness that makes you laugh and the silliness of British dry humor, then this will be entertaining to you. With his assignment tucked away in his sieve of a mind, he reconnects with Ambrose, his old fellow agent. While his old partner is apparently thrilled to reconnect with Johnny, he is a suspicious character, cocky and self-serving. Now, Johnny gets reacquainted with Quartermain, master inventor of spy goods. Armed with secret agent weapons, English stumbles and bumbles his was into the field. This spoof on James Bond is hysterical. Johnny is looking for clues. He finds unique keys that lead him to Vortex, the triad of evil that is plotting the assassination. They are a super secret organization. Our hero is stunned when he realizes that the three evil partners includes a mole within MI7. Looking for the traitor is not easy. But, the goofiness of the episode kept me laughing. Throughout the movie are episodes of the Chinese elderly woman whose assassinations keep missing English. In turn he mistakes her identity with the wrong seniors. Who can carry out this kind of silly venture while maintaining a plot has to have some on-screen talent. Ultimately, the bad guys lose. 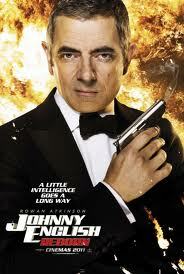 Johnny English is the hero. He is also reconnected with his past credentials and knighthood. Rowan Atkinson has the look for his role. His body language is schooled after years of Mr. Bean antics. His first Johnny English spoof guaranteed that a sequel would be made. Here it is and it is just as humorous. Criticism is far too common in the church. When someone is serving the Lord it is inevitable that they will come into conflict with others, both Christians and those who are not. One of my teachers observed, if you don’t want to face criticism, then, don’t say anything, don’t try anything, don’t do anything. Personal integrity is not a product of the opinion of a few. It certainly is not what a minor group of people hold in secret. That is a grudge not truth. Instead, the Apostle teaches us that our conscience before God is the repository of true integrity. The presence of criticism is never the test of sincerity. Rather, it is a clear conscience before God. God’s grace is the basis for an evaluation that has worth. Worldly wisdom is not. Choose wisely when addressing the reputation of those with whom you serve. Understanding is within reach and available for any who are interested. Even the apostles and their entourage are not perfect but under God’s grace they are worthy of boasting. Embedded in the apostles’ integrity is his consistency. He will not say one thing to one person and then something else to another. Rather, he speaks the same message to any and all. The message of Jesus Christ is not an accommodation. Making sure that everyone is comfortable is not what the truth is all about. Rather, truth is open and available to all. No one can criticize the Lord for overwhelming us with too many promises. That tactic is ludicrous. Christ came with a message of freedom not restriction. It is not an impossible life. Rather, it is a likely life. God makes it positive by connecting us with His son Christ. He approved our life with a seal of ownership. We belong to Him. His Spirit indwells us to make our future certain and our present successful. Misunderstanding is a part of conflict among believers. Paul did what he could to alleviate this with openness. He explicitly assures the Corinthians that he wanted to see them. Furthermore, he denies control issues and asserts his desire for their continued joy.